InvoicePlane is a self-hosted open source application for managing your quotes, invoices, clients, tasks and payments. Downloaded more than 100 000 times from 196 countries. The application provides CRM-like management for your clients. Enter contact details, notes or add custom fields to add any information you want. You can customize InvoicePlane to make sure it fits your needs: amount format, languages, email and PDF templates and many more. 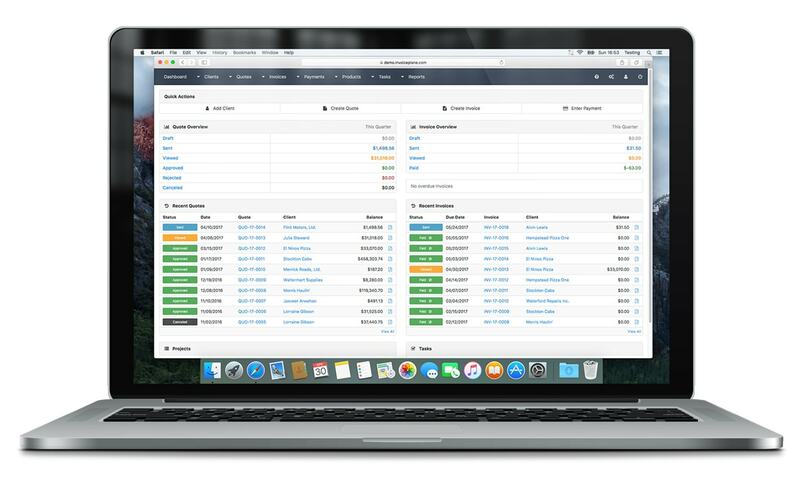 Let your clients pay the invoices by using one of 25 different online payment providers like PayPal, Stripe or even using Bitcoins via Coinbase. Create projects for different clients, add some task and you can reference them directly inside invoices.